You can find a Chinese restaurant or bagel place on any corner in New York City it seems. Block after block there are certain goods and foods that are ubiquitous. What you wont’ find everywhere is a cigar shop! 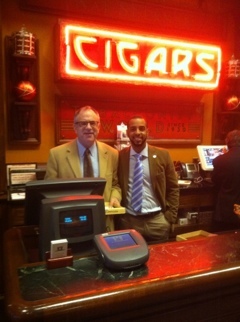 During my stay for the Big Smoke in NYC 2011 I wanted to hit a few cigar shops if possible. 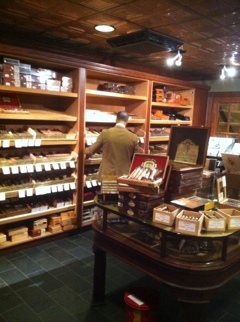 First on my list was the Nat Sherman store at 12 East 42nd Street near Bryant Park. Though Nat Sherman is not enjoying the frenzy surrounding many brands today, largely due to boutique blenders, they have recently developed new blends based off extensive experimentation and trials in a fairly condensed amount of time. What has come out is a new direction of flavor for Nat Sherman and one that it hopes customers will embrace obviously. Aside from the new line they have brought in many other lines of cigars that they traditionally did not sell. With the gentlemanly attitude, superior service and great location, I think they have a winning combination. I have not smoked the Nat’s I picked up due to a sinus meltdown/cold that is killing me and would ruin any good smoke. I hope to smoke it before Christmas, but who knows. The tobacconists there were very kind and Juan spent a good amount of time with me talking about various cigar issues and blends. I’m always appreciative of an informed staff! After my time there I walked back through the park, unfortunately the politicians of New York City have exercised ridiculous judgement and banned anyone from smoking in NYC parks. I would have loved to fire up a cigar and stroll some park ground but I was sequestered to the sidewalks. After picking up some “meat on a stick” from a sidewalk vendor I found my way over to 515 Madison Avenue where I found the Davidoff of Geneva store. They have quite the Davidoff line, if that is your thing, but also have many other blends and brands. I spent some time with the buyer for the store and he steered me to a couple of new products that I had not tried. Like a good tobacconist, he also steered me away from some that he thought I would not find pleasing. This is saying a lot considering he actually bought them and then dissuaded me from buying them. It’s not that the one I had picked up was bad, but once he explained the characteristics of it I agreed that it was not what I was in the mood for. So I hung out in the lounge there for a good two hours and made some very good conversation with some New Yorkers and one gentleman from Kentucky. It’s a very nice lounge that faces the street. The air filtration system is so good I believe there was at one time a dozen people in there and you were never bothered with a haze of smoke. As luck would have it, there was a cigar representative from Room 101 cigars with a sample pack and swag. They also had a lovely young lady there to help present their products. Of course I do not pass up the opportunity to get the picture. 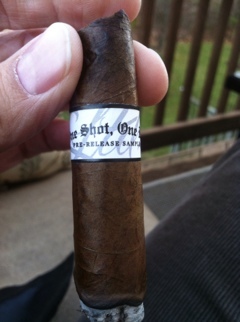 With the sample pack I bought I got a free shirt and a pre-release sample of their “One Shot, One Kill” cigar that will most likely be out soon. I have smoked that, it is a small cigar that has good strength and a medium + body. I look forward to smoking my way through their line. All in all, I seriously enjoyed my time at these two cigar shops. I wish I had more time because I had a couple of more shops on my list which I will find next time I’m up in NYC.